This is my go-to mixing bowl. Love the handle and lid for fridge storage, when needed. It's microwave safe, and perfect for this recipe. These are a great size for storing this sauce in the fridge or freezer. I use these jar lids for their durability and ease in putting them on and off. The lids and rings that come with mason jars are intended for single use and will eventually rust. 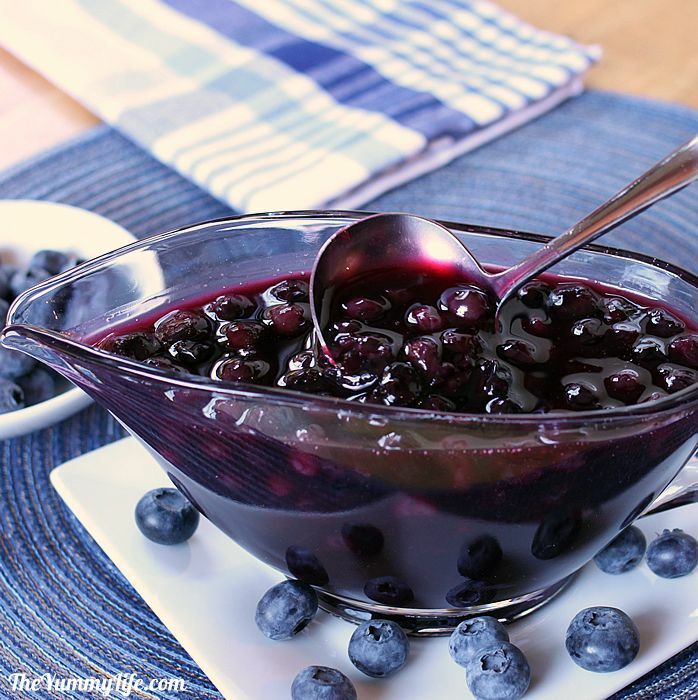 Make this delicious, flavorful sauce in under 10 minutes using fresh or frozen blueberries. Top ice cream, cheese cake, pancakes; add to yogurt or smoothies and more. 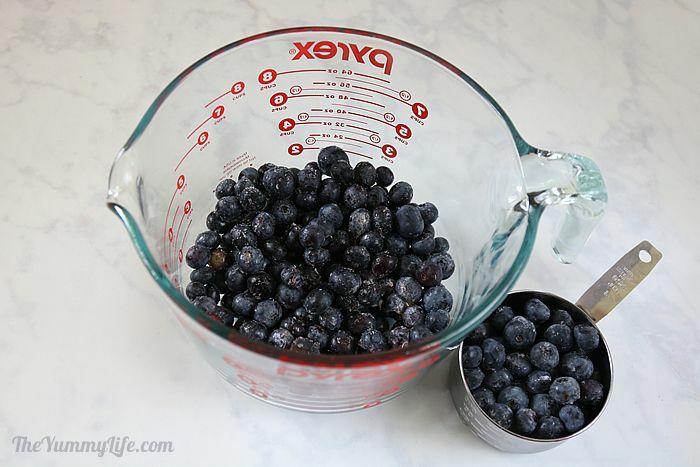 Add 2 cups blueberries to 2-quart microwave-safe mixing bowl (set aside remaining 1-cup blueberries). Add corn starch to berries in mixing bowl and toss until berries are evenly coated. Add orange juice, brown sugar, almond extract, and cinnamon. Stir to combine. Microwave blueberry mixture uncovered at full power for 8 minutes. Stir in remaining blueberries and cool uncovered at room temperature for 30 minutes; sauce will thicken some as it cools. (If too thick, may be thinned by stirring in water 1 tablespoon at a time until desired consistency.) Cover and store in refrigerator. You can eat this sauce right away, however the flavor improves if you make it ahead and let the flavors marry in the fridge overnight. Keeps for at least 1 week. May also be frozen for up to 6 months. Serve over ice cream, cheesecake, angel food cake, pancakes, waffles, or French toast. Mix into yogurt or smoothies. It's fast and easy! I figured out a microwave version for this recipe to make it fast and to keep the heat out of the kitchen. 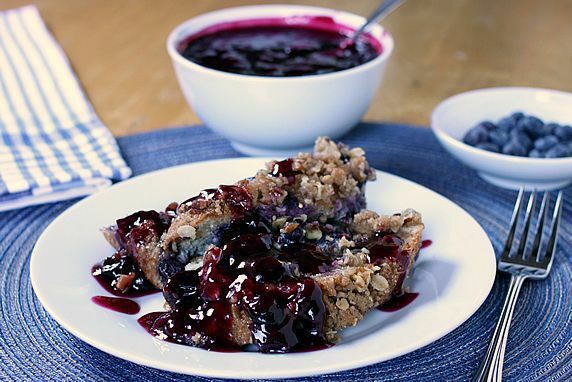 Like my Microwave Raspberry Sauce, this blueberry sauce can be made at the last minute. I always stock frozen blueberries in my freezer so I'm ready to make a quick batch. Refrigerate or freeze. 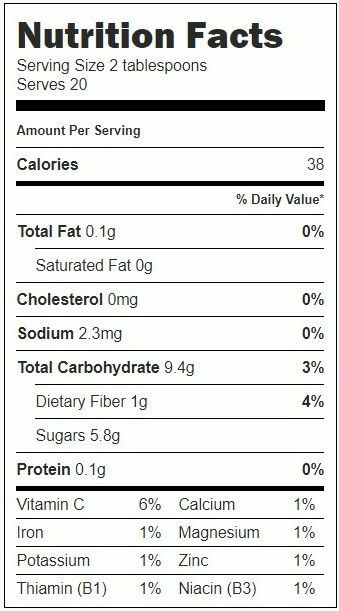 You can eat this sauce right away, however the flavor improves if you make it ahead and let the flavors marry in the fridge overnight. It can be refrigerated and eaten within a week or frozen to enjoy throughout the year. Step 1. 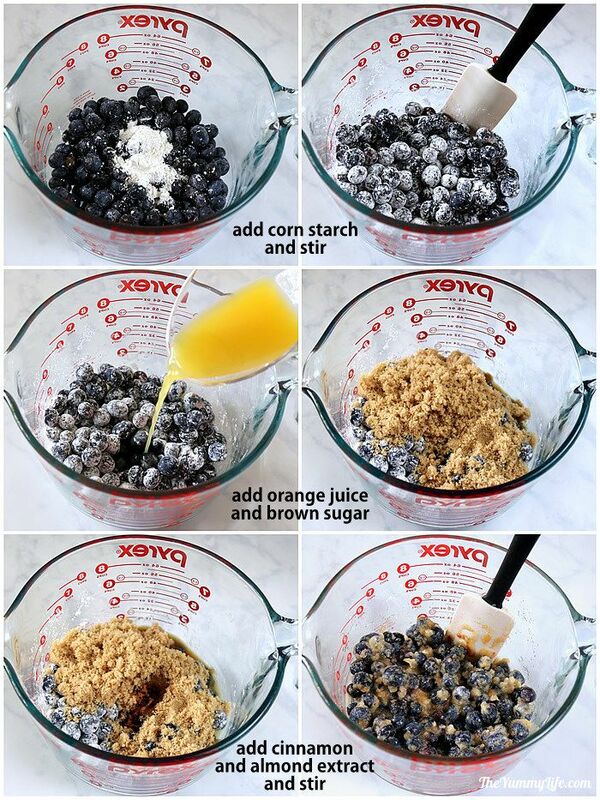 Assemble the ingredients: blueberries (fresh or frozen)*, brown sugar, orange juice, almond extract, cinnamon, corn starch. Frozen blueberries are picked at their peak of ripeness and often provide consistently better flavor and deeper color than fresh grocery store blueberries. I choose frozen over fresh, unless I have access to homegrown or in-season, freshly picked blueberries. 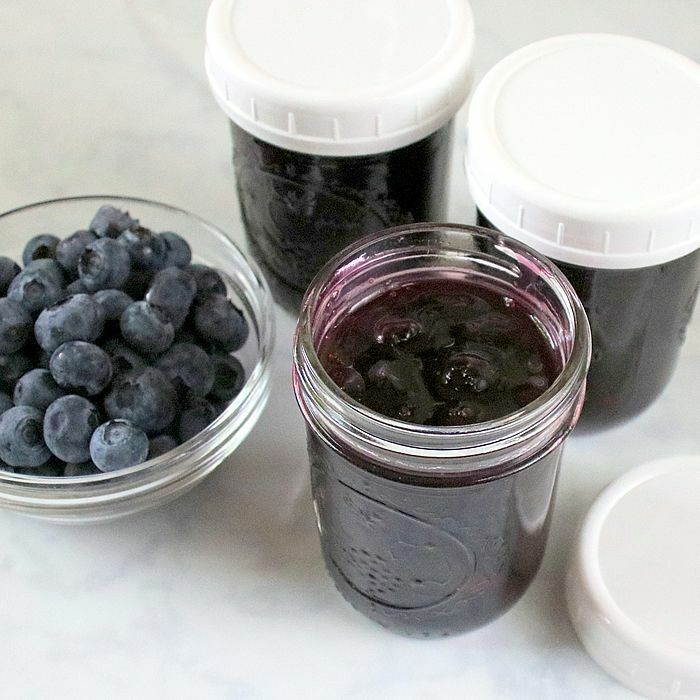 If you're using frozen blueberries, they do not need to be thawed before making this sauce. They'll thaw quickly as they cook in the microwave. Step 4. Add orange juice, brown sugar, almond extract, and cinnamon. Give it a stir. Step 5. Microwave blueberry mixture, uncovered, at full power 8 minutes. Step 6. 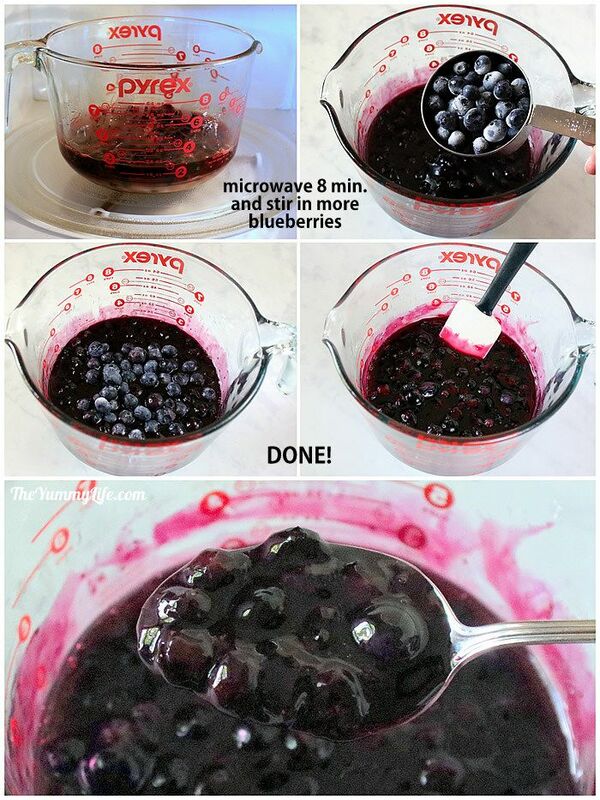 Remove from microwave and stir remaining cup of blueberries into the hot liquid, just until combined. Stirring these whole blueberries in at the end results in a chunkier sauce, because the uncooked ones hold their shape better--they cook just slightly while they sit in the hot mixture. 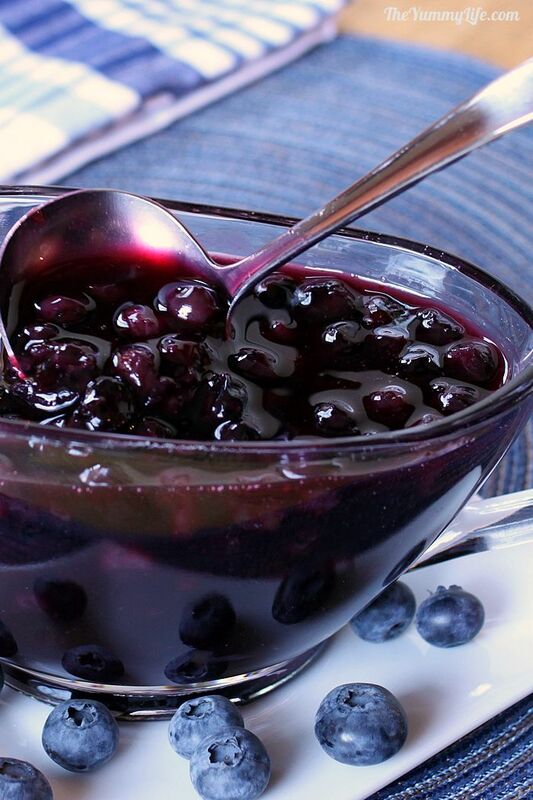 I like having whole visible blueberries in my sauce to give it that homemade, real blueberry look and texture. Step 7. Let the sauce sit on the counter for 30 minutes uncovered. It will thicken some as it cools. Step 8. Cover and put it in the fridge to cool completely. I store mine in half-pint mason jars. It's such a treat to have this fresh-tasting summer sauce in the middle of winter. To thaw, move it from the freezer to the refrigerator the day before use. For faster thawing set it out on the counter for 1-2 hours. This is an updated post that was originally published February 8, 2012.